Inspired by the modern kitchen, Kraus has developed Geo Axis, a streamlined pull out kitchen faucet with a longneck spout and an ergonomic dual function pull out sprayer for spray & stream functionality. This water-efficient kitchen sink faucet has a minimalist silhouette that adds a contemporary touch to any kitchen. 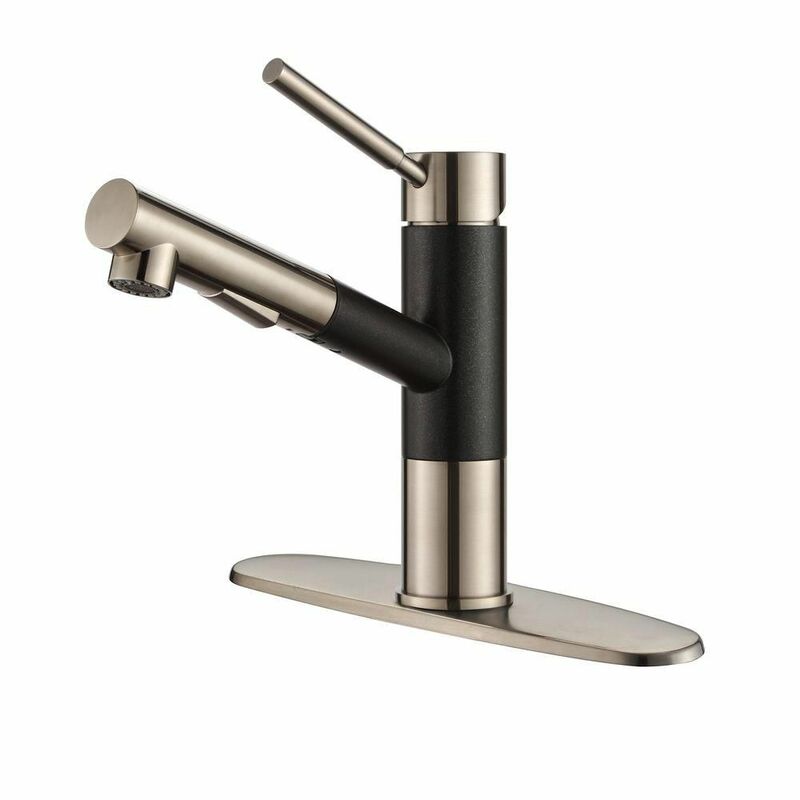 The single handle faucet design offers effortless temperature and flow control. Top quality components include a precision Kerox ceramic cartridge, a water-saving Neoperl aerator, and flexible easy-clean nozzles for a long-lasting powerful flow. All required mounting hardware and an optional deck plate are included for 1, 2 or 3 hole installation. Customize the look with a choice of sleek stainless steel finish or a unique two-tone design with SpotLess Black Onyx finish. Delta's exclusive DIAMOND Seal Technology uses a valve with a tough diamond coating. InnoFlex PEX waterways keep water inside the faucet out of contact with potential metal contaminants. This powerful combination brings you a faucet built to last up to five million uses. Only Delta faucets are equipped with Touch-Clean. soft, rubber nubbins that allow you to easily wipe away calcium and lime build-up with the touch of a finger. With Touch2O. Technology, it doesn't matter if you have two full hands or ten messy fingers. Tap anywhere on the spout or handle of the faucet with your hand, wrist or forearm to start and stop the flow of water. Delta ShieldSpray Technology cleans with laser-like precision while containing mess and splatter. A concentrated jet powers away stubborn messes while an innovative shield of water contains splatter and clears off the mess, so you can spend less time soaking, scrubbing and shirt swapping. Delta MagnaTite Docking uses a powerful integrated magnet to pull your faucet spray wand precisely into place and hold it there so it stays docked when not in use. Delta faucets with Diamond Seal Technology perform like new for life with a patented design which reduces leak points, is less hassle to install and lasts twice as long as the industry standard. Geo Axis Single-Handle Pull-Out Kitchen Faucet in Stainless - Spotless Black Onyx Inspired by the modern kitchen, Kraus has developed Geo Axis, a streamlined pull out kitchen faucet with a longneck spout and an ergonomic dual function pull out sprayer for spray & stream functionality. This water-efficient kitchen sink faucet has a minimalist silhouette that adds a contemporary touch to any kitchen. The single handle faucet design offers effortless temperature and flow control. Top quality components include a precision Kerox ceramic cartridge, a water-saving Neoperl aerator, and flexible easy-clean nozzles for a long-lasting powerful flow. All required mounting hardware and an optional deck plate are included for 1, 2 or 3 hole installation. Customize the look with a choice of sleek stainless steel finish or a unique two-tone design with SpotLess Black Onyx finish. Geo Axis Single-Handle Pull-Out Kitchen Faucet in Stainless - Spotless Black Onyx is rated 4.5 out of 5 by 195. Rated 4 out of 5 by Irene from Looks great. Well made. I installed it easily all by... Looks great. Well made. I installed it easily all by myself. The only reason I did not give it 5 stars is it may not be durable enough for a household full of boys. Rated 5 out of 5 by Zisa from Love it! This faucet works perfectly and is beautiful. I love it. Rated 5 out of 5 by DDL2019 from Fantastic product Love the sleek modern look. Easy to install and good strong water pressure. Rated 5 out of 5 by Rejenvelo from Superbe Works great, good pressure, very nice look, goes well with black granite sink. Rated 5 out of 5 by kelise313 from Great Product This product is the perfect compliment for the black and white color scheme I have been working with for my kitchen. Compact and stylish design doesn't overwhelm visually like those huge gooseneck styles. So far, this works fine, pressure and flow great and the pull out hose retracts and has a notch that holds the nozzle in proper position. LOVE IT! Rated 5 out of 5 by Tree from This is just the right faucet. Works well in... This is just the right faucet. Works well in my kitchen and give my kitchen an "update"! Rated 4 out of 5 by Karen from Gorgeous Design The Kraus faucet was just delivered and it is better looking than in the photos. I'm looking forward to having it installed at my Kraus farmhouse Standard Pro sink. Geo Axis Single Lever Pull-Out Kitchen Faucet: Can't tell by the picture. Is that a chrome finish or brushed finish? As well, confused write-up. Overview states: Durable Stainless/Spotless black Onyx finish. Details it states: Spot Resistant Finish - No? ?